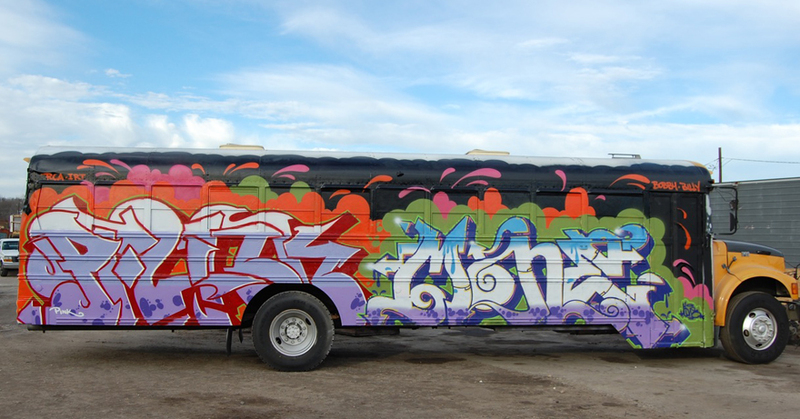 MONE is a New York City graffiti writer and Freight King who’s been in the game for over two decades, before it became the latest trend. Starting out in the streets of Mount Vernon, New York in the late 1980s he progressed from bombing walls to painting freights in the early 1990s. His pieces are recognized from coast to coast. I recently had the opportunity to interview MONE about his graffiti work back in the day and the current state of street art. VM – When did you start painting and what inspired you to pick up a spray can for the first time? MONE – I grew up in New York in the early 1980s, which was a really different time than now. In those days the subway trains were covered with graffiti. I used to take the train with my mom and found the colors and names intriguing for some reason. I couldn’t really understand what was going on, but it fascinated my young brain. I started in 1988 when I was a junior in high school. I was looking at graffiti a few years prior to this but was too young to get out of the house to actually do anything. VM – Did anyone take you under their wing when you were coming up? M – JENT taught me the most when I was young. I met him in the 8th grade and he was already a grown man in his 20s. I knew his work well and he was someone that I really looked up to. Aside from writing we were both big metalheads. I would hang out at his house listening to Slayer and Suicidal Tendencies while he would help me to draw outlines. He took me out to paint a few times and helped me with some of the basics: how to fade colors together and stuff like that. VM – Do you prefer to paint with other writers or solo? M – It depended on my mood. At times I enjoyed painting with others, especially if there was some kind of theme to what we were painting. Other times I liked to just go out and do my own thing. I used to find it very relaxing to be out somewhere by myself painting in the middle of the night with no one else around. VM – Who would you say is the most underrated writer? M – Of the writers that I personally saw painting I would have to say Vet TMC. For the amount of work and years he put in I really don’t think that he gets the full credit and respect that he deserves. Overall though, I think a lot of the writers from the early to mid 1970s. VM – Do you get inspiration from other art forms? M – I like comic book art, old DC and Marvel stuff. Aside from that, music artwork — CD covers, things like that. Fantasy art is something that I really enjoy as well. 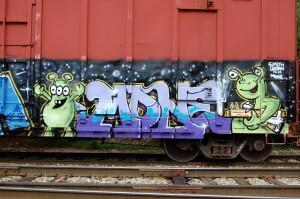 VM – Have you ever painted a train during the subway-graffiti era? M – No. I was painting for less than a year and knew nothing about subway yards. That was a dream that I had but I started out a little too late. 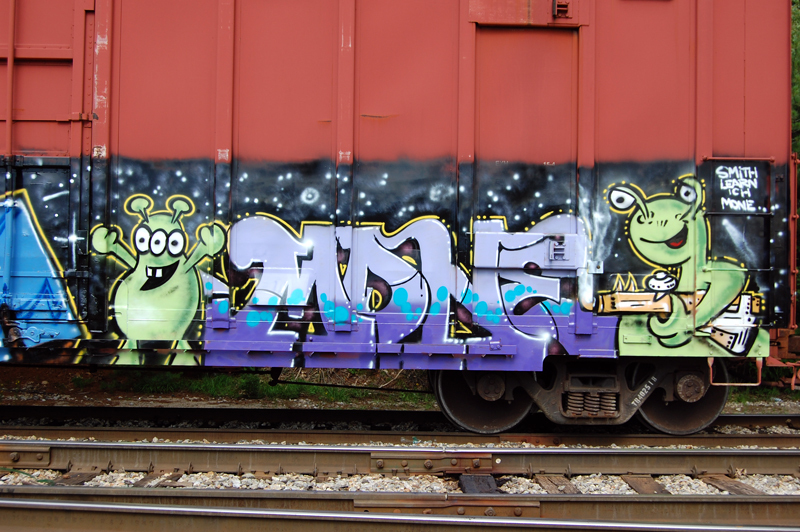 I painted a subway car after the MTA made the trains graffiti proof in the early 1990s, but it’s not the same. VM – Can you share some sick painting stories? M – I have painted in some crazy conditions. I once painted up north with some friends and it was 40 below with the wind chill. We would paint a bit and then run into the car to warm up. Another time I fell 15 feet from a tree in to the Bronx River after being raided at an elevated freight layup. I also remember getting chased and attempting to escape through a hole in a fence that had lines of barbed wire to cover up the opening. Luckily, it was winter time and I was pretty bundled up so I escaped with only a few minor flesh cuts. 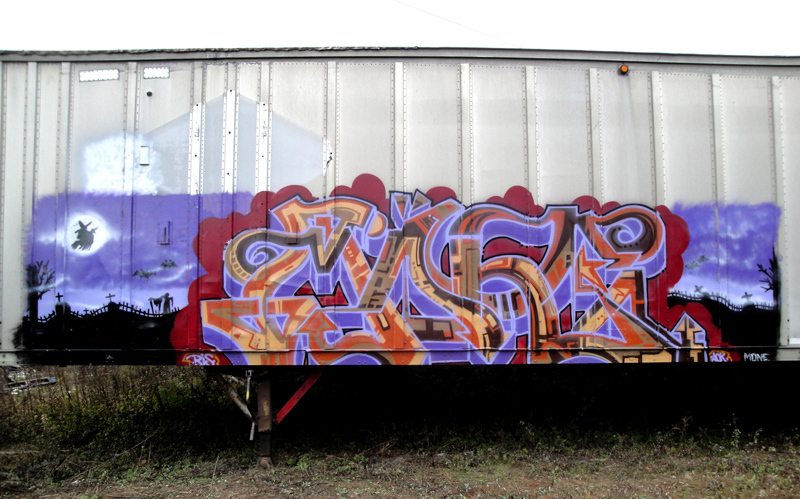 VM – What makes painting freights worth the risk? M – Honestly, these days I’m really not active as far as freights go, but freights were a very powerful thing to me. When you paint something on a freight, and you know that it will be going to places that you probably will never be able to see in your lifetime, it is pretty deep. I feel as if a part of me went along with every piece that I did. It’s like the painting is an extension of who I am and is going to be traveling on this long journey – destination unknown. VM – Where else have you painted besides New York? M – I painted in Florida and did a few things out on the west coast. I was involved in the music scene for several years and travelled abroad. I would always make sure to have a marker or can of paint on me no matter where I went. VM – Where is the furthest place one of your freights has been spotted? M – My freights have been to every corner of the country. I have had numerous freights spotted in Canada. VM – If you could do a piece anywhere in the world, where would it be? M – The pyramids in Egypt. I highly doubt that will every happen though. Rome is somewhere that I would love to get to sometime soon. The subways there look a lot like they did over here in the 1980s — covered with paint. I would love to be able to experience that before it comes to an end. VM – Yah I also highly doubt a piece on the Great Pyramids will happen! Aside from the U.S., which countries have the best writers? M – It’s really hard to say. My opinion as to where I have seen some of the best work would probably have to be Germany, Denmark, Italy and Spain. VM – What do you think of the new writers coming up and what advice would you give them? M – Just do what feels right to you. Writing is a form of expression and should be very individual. From the politics side, I would say watch who you associate with. Don’t get caught up in all the drama. Realize that you don’t need to put your business on the internet in order to get respect. If you do some decent work and stick with it people will notice you. Also learn some history. You don’t need to know who everyone was that came before you, but know some basic stuff as to how things started out and evolved to what they are today. VM – Graffiti has exploded in the mass media. The market is flooded with books, documentaries and mass produced clothing and accessories. What are your thoughts on that? M – One of the things that really attracted me to writing in the first place was that it was secretive. It was almost like this underground lifestyle that unless you were a part of you would have no clue about. I feel like a lot of those elements are gone. When I started there were only two books on the market and one magazine. In the early 1990s you started to see more magazines, videos and books popping up, but the people doing them were legit writers. They were people who were a part of the culture and not trying to exploit it, or make money off of it. Now you go to the bookstore and see tons of books on graffiti and you’re thinking to yourself, “Who the hell are these people putting these books out?” Unfortunately, there are way more people out there that only see dollar signs and know nothing nor care about the culture. 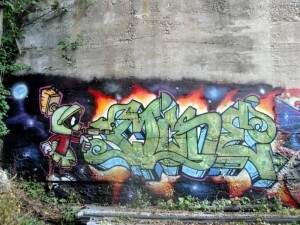 VM – What has kept you interested in graffiti for so long? M – It’s one of the very few things from my youth that really stayed with me all these years. I look at new work being done by old writers and that keeps me interested. I see something that I did years ago that I forgot about and it resurfaces which motivates me. Some of my best friends to this day are people that I have known for 20-plus years and our common interests stem from writing. It really is more of a lifestyle as opposed to a hobby. VM – Can you tell us where you’re painting next? M – On a model train in my studio. I have one that was sent to me to paint for the “Steel Wheels” show in Atlanta on March 30. It’s not as exciting as when I was out there painting a real train but it has its advantages. I can keep warm when it’s cold outside and can blast some metal in the background. You can’t beat that. Love graffiti, it truly is artwork work. Jean-Michel Basquiat was one of my favorite graffiti artists. Lol. Just came across this. You are as wack as they come. Good guy and great artist, always enjoyed his new stuff. I do appreciate graffiti as an art form, folk art to me if anything. I enjoyed the spraying but never enjoy the risk. Then again would you do drugs if it was legal? Maybe, maybe not.